Sizzle Stix are 16â€ long (406 mm) strips of dichroic glass cut from thin (2 mm) Bullseye Compatible clear and black glass, pre-fired to round the edges and minimize thermal shock in the flame. Wide Sizzle Stix are 1/4â€ (6 mm) wide and sold in tubes of twelve. 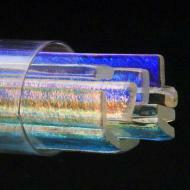 Narrow Sizzle Stix are 1/8â€ (3 mm) wide and sold in tubes of eighteen.